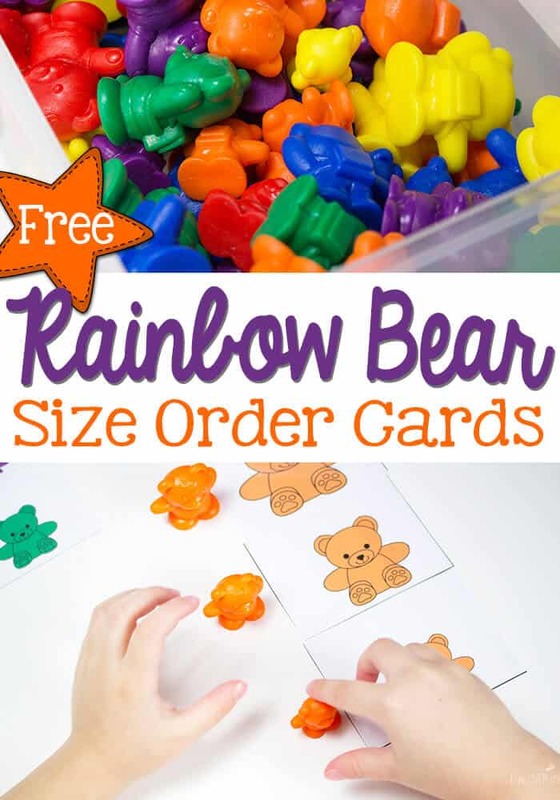 Pin my quick guide for Rainbow Counting Bear activities. 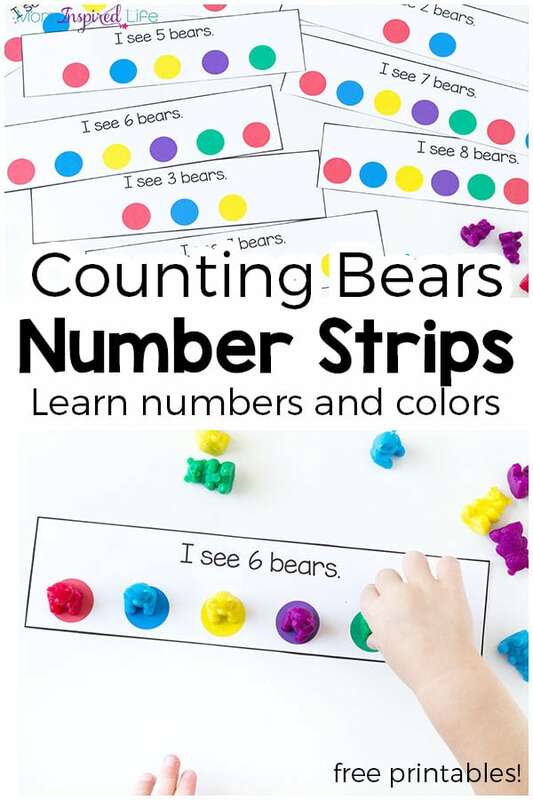 Counting bears provide endless opportunities for open-ended play, and the internet is full of free printable activities to encourage math and learning skills. Plus, my toddler is enthralled with these little bears, which makes it easy for me to sneak in a tot school lesson throughout the day! Amazon sells a various kits that may also include sorting cups, different sized bears, scooping tongs, and dice. We recently purchased this Skoozly kit. Because my toddler is only two, we mostly stick to color sorting, scooping, turn taking games, and counting activities. Here are a variety of activities you can do with your toddler using these bears. They truly are a wonderful, open-ended toy with endless possibilities! 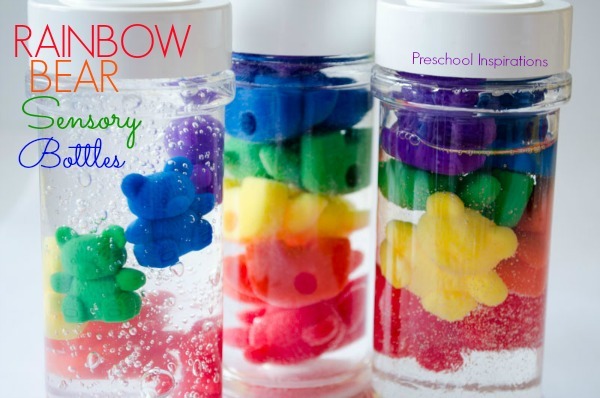 Combine rainbow bears with sensory bins and other experiences. 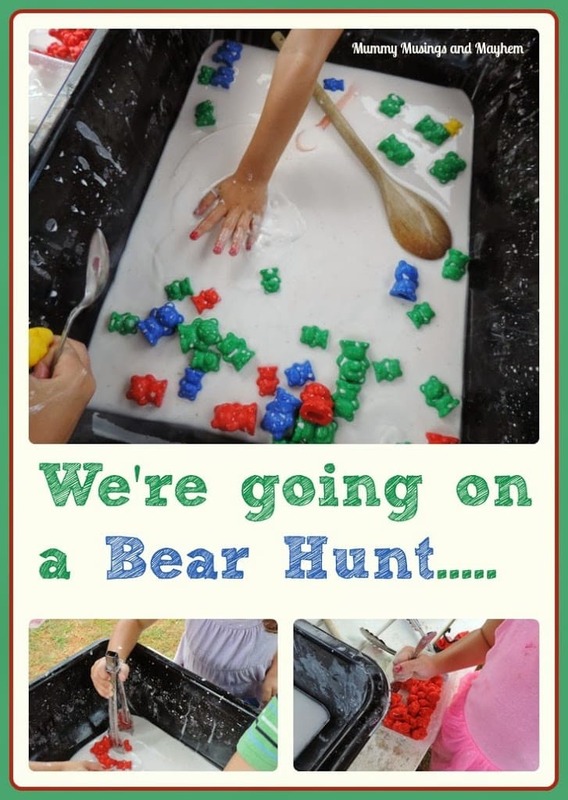 Check out this cool activity from Preschool Inspirations using bears and hair gel to create sensory bottles. The Empowered Educator also had a fun sensory bin idea. I don’t know why, but kids love getting messy. This one may be better suited for outside or bathtub play! Sensory activity by The Empowered Educator. Our kit came with scooping tongs, and my daughter is learning how to use this tool to collect her bears and drop them in various containers. Right now, we are working mainly on coordination and motor skill development as she is learning to manipulate the tongs. Once she’s more proficient, we’ll move on to incorporating them in other sorting and math activities as well. Our kit also came with a large dice that has different color bears on each side. My two-year-old loves rolling the dice, calling out the color, and picking up the correct bear. We usually take turns rolling to help her practice turn taking and sharing. Sometimes we will sort the bears by color or put them all in one container to count after. I found this printable board game on Pinterest. Although we haven’t had a chance to use this yet, it’s on my to do list! I love finding activities that we can play as a family as well as free printables. Rainbow Colors Board Game for Toddlers by Simple Fun for Kids. Click here to see more. These bears have helped take my child to the next level with color identification. Prior to these, she didn’t have much of an attention span for sorting, but now she loves dropping the bears into different cups (for a little while at least). Plus, her speech has improved over the past few days as she tells me which bears go in which cups. On days that my daughter has a lot of energy, I put the bears in a different room or down the hall so she has to run/walk back and forth as she sorts. Another spin on this activity is color matching. Check out this free printable color matching game from Life Over C’s. 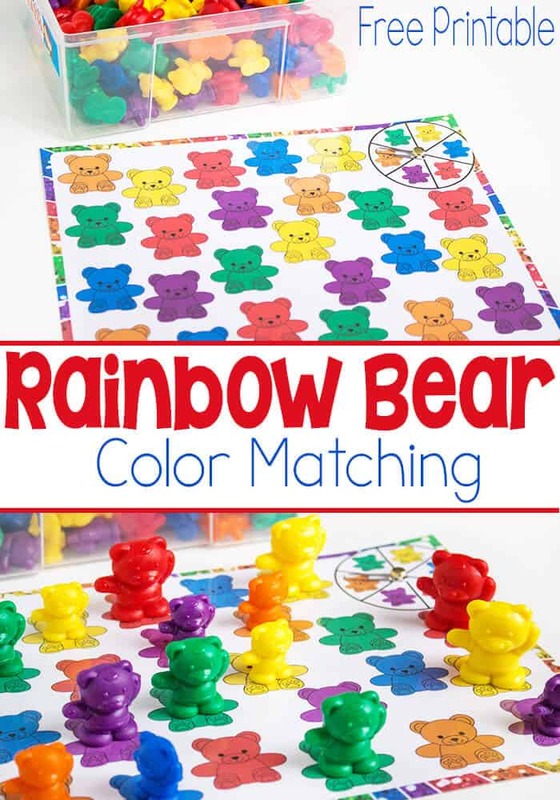 Printable Rainbow Color Bear Matching Spinner Game by Life Over C’s. Although our kit did not come with various size bears, some kits do. Here are two printable activities to practice identifying and sorting by size. Printable from Life Over C’s. Printable from Still Playing School. My toddler recently started learning to recite numbers 1-10. Now, I’m working to teach her that those numbers mean quantities, so ten bears is a lot and one bear is a little. Also, we are working to recognize and understand numerical symbols. So “1” SAYS one, and one bear IS one. My little one loves the song Wheels on the Bus, so this printable activity is an instant hit. 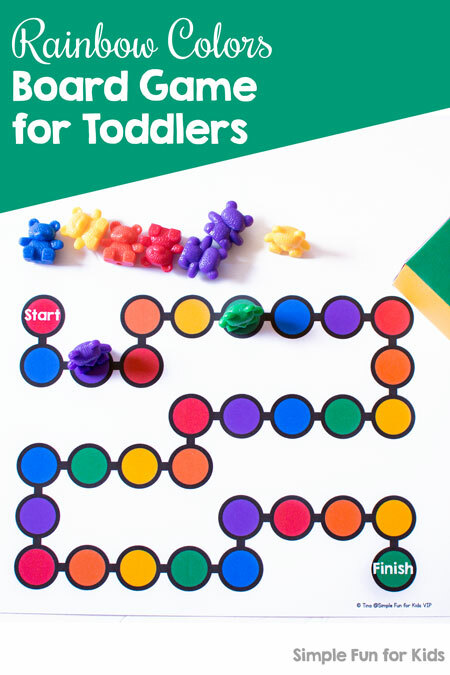 For older toddlers, this printable activity by Fun Learning for Kids looks awesome as it combines colors and counting in a simple, easy to understand design. Printable activity by Fun Learning for Kids. Does your family love these rainbow counting bears as much as I do? Share your favorite activities and printable below. And, follow my Pinterest board devoted to Rainbow Counting Bears. 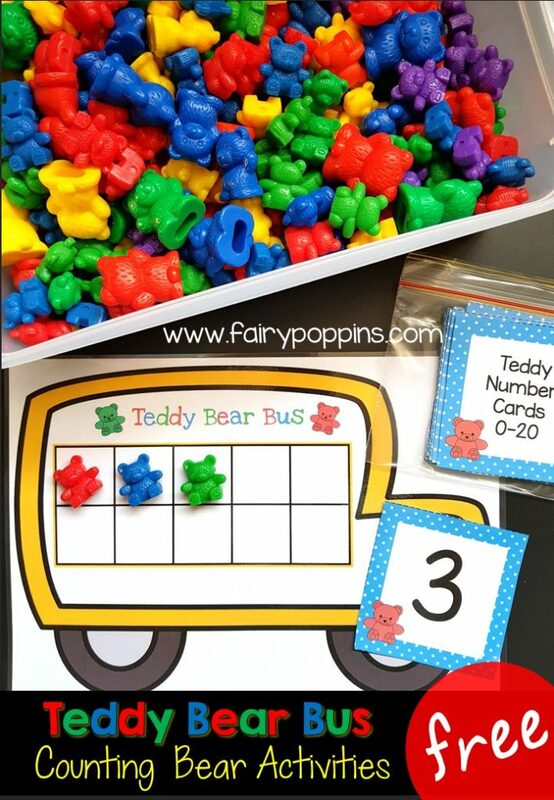 I’m always adding new activities and ideas just for these colorful learning bears.